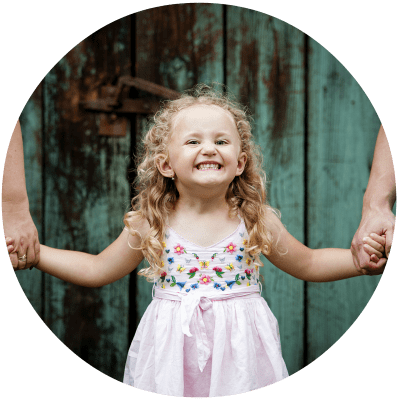 Running a household and raising a family can be a lot to manage at times. That’s why I’m a huge believer in using a planner. 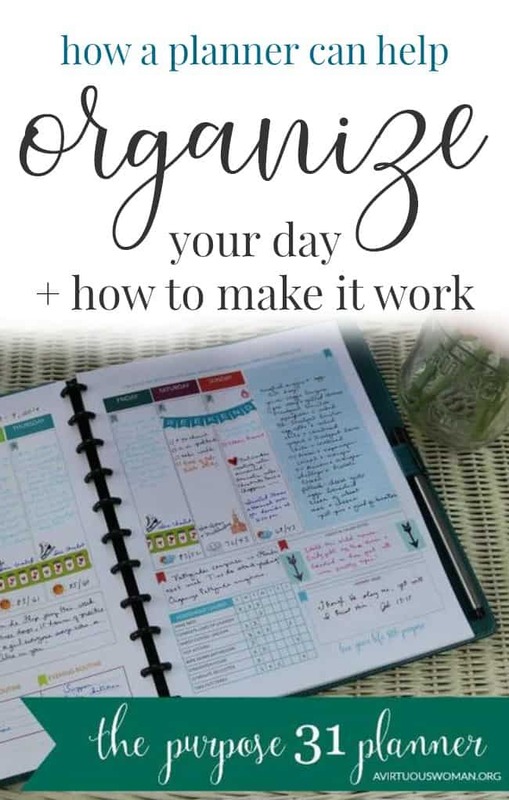 Today I’m talking about how a planner can help you organize your day. When you’re faced with appointments to set, errands to run, meals to cook, floors to clean, laundry to watch, birthday gifts to shop for – and the list goes on – it can be overwhelming to try to manage your time and get it all done without an effective system to help you organize your day. Using a planner can help keep you on track and lets your brain have a break from having to remember everything you need to do. I rarely leave the house without my planner or a notebook to jot things down. My planner is my go to book for remembering all the details of my life and goals I want to accomplish in the future. A planner can help you keep track of all those things you need to remember whether you have toddlers or teens – or no kids at home. A planner can help you manage your time. When you’re trying to accomplish a million things in a day, it can be easy to convince yourself you can get them done in half the time it’ll actually take. While you might be able to fool yourself into thinking this way when your to-do list lives in your mind or on an app, writing down your tasks in your planner and blocking off the time needed to complete them will really force you to reevaluate your expectations. It’s really important not to try and pack too much into one day. You are only one person. And if you have young children, this is even more important. I often recommend you only schedule one task per hour. If you have kids, choosing just a few things to do each day will help you check off your list each day and not overwhelm you. You can use your planner to manage your time as detailed or as broadly as you need to. For instance, you can block off eight hours a day as “running errands” and leave it at that. Or, you can go into greater detail here, penciling in the appointments you need to attend and planning the order of your other stops to maximize your time. A planner can help you identify your daily priorities. You might find yourself faced with days where you just don’t know how to start tackling everything on your to-do list. By having a dedicated space where you can write down everything you need to accomplish – including the stuff from the previous day’s to-do list you couldn’t find time for – you’ll be able to review everything objectively and organize your day to ensure you take care of the most important tasks. I like to choose my top three priorities for each day. For instance, this morning I needed to call two doctors and schedule appointments for Hannah. That was a top priority. I also want to make a couple more freezer meals today for next week when life gets back to it’s normal hectic pace. And finally, I need to make another phone call today. One of the best habits you can add to your life is to just get those top three priorities done first thing every day. Writing down your top three in your planner helps you not only remember, but it also gives you a place to keep track of things that really are important. I know I’m guilty of forgetting stuff way too often if they aren’t written down. A planner can help you keep track of life’s little details. With so much going on in life, it can be easy to lose track of the little details, like dates, that mean a lot to the people you love. Use it to keep important days, like birthdays and anniversaries, on your radar so you don’t miss out on big days. In addition to using your planner to track dates worth remembering, you can use your planner to document plenty of other details to help you organize your day. Many planners incorporate spaces for notes, which you can use to track anything from the evening’s dinner menu or your grocery list to documenting your water intake or writing a quote you’d like to remember throughout your day. This is one of the reasons why it’s important to be thoughtful when choosing your planner. With so many options to choose from, you should be able to find a layout that’s perfect for you. If you’re looking for a better way to organize your day, consider making a planner a part of your personal routine. You’ll be better equipped to manage your time, choose your priorities, and keep track of life’s little details as you navigate your days, and you’ll find you’re able to tackle everything on your to-do list with ease. What do I write down in my planner? I write down a lot. I’m definitely a pen and paper kind of girl. I do use my digital calendar on my phone to keep up with appointments for doctors and such in the future. I write them down in my planner too. So, my planner is a record of lots of different things. I like to write down my appointments and reminders. I write down birthdays and other special dates to remember. I like to write down my monthly goals, quarterly goals, and yearly goals. I write down our schedule on really busy days. I write down my to do list. I take notes for projects I’m working on. I like to brainstorm ideas. I write down my editorial calendar for my blog. I write down special things my kids say. I write down traditions and things I’d like to do as a family. Basically, if I can write it down, I write it down. 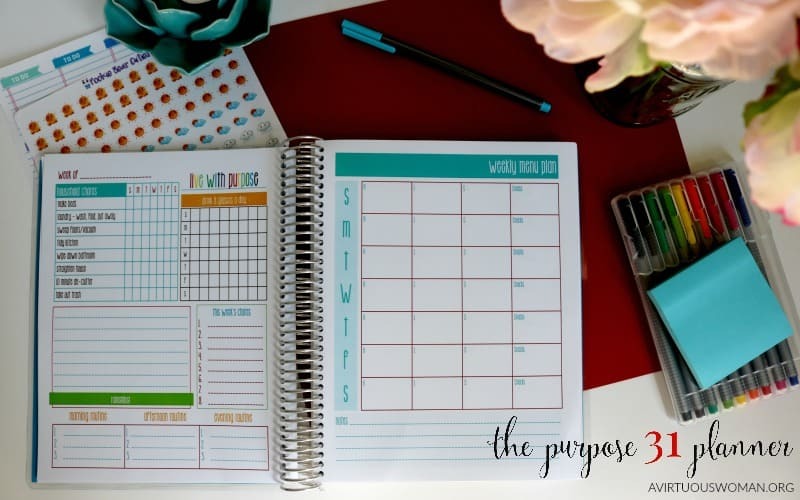 A planner can be an incredible tool for keeping you on track as you manage your household, raise your children, cultivate your relationship, and pursue your personal goals. Whether you consider yourself an organizational pro or you feel like you’ll never be able to get it together, a planner can help you bring more order to your day, manage your time, prioritize your tasks and stress less. In order for a planner to do this, however, you actually have to use it. 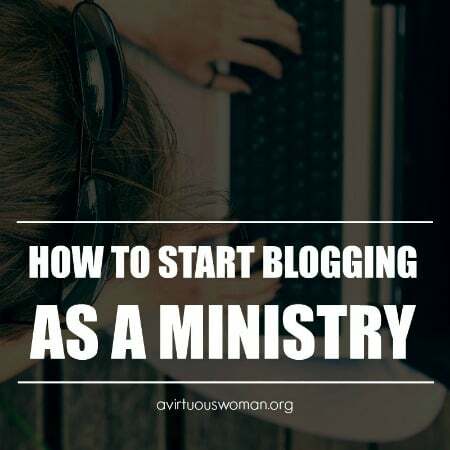 And unfortunately, many people set out filled with ambition, ready to use their planners to transform their lives, and end up forgetting about them a week or two into the process after only a half-hearted attempt at using it as a tool. While you can’t just snap your fingers and force yourself to use a planner, there are definitely some steps you can take to help yourself put it to good use. Make time for your planner. One of the best ways to keep up with your planner is to make it a part of your daily routine. Dedicate a few minutes every evening and morning to sitting down with your planner to organize your day. You’ll come to look forward to taking this time to figure out what’s in store and put a little bit of thoughtful consideration into the day ahead. 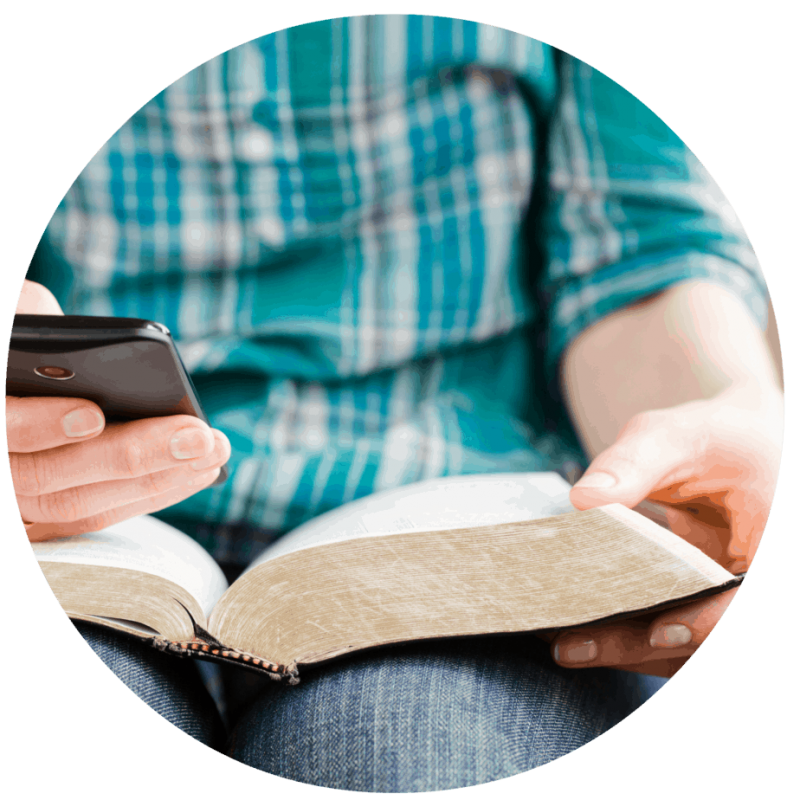 I suggest that you sit down with your planner first thing in the morning after your prayer time. Spend a few minutes reviewing the day, making note of anything important, and then pray over your day and ask God to lead you all day long! 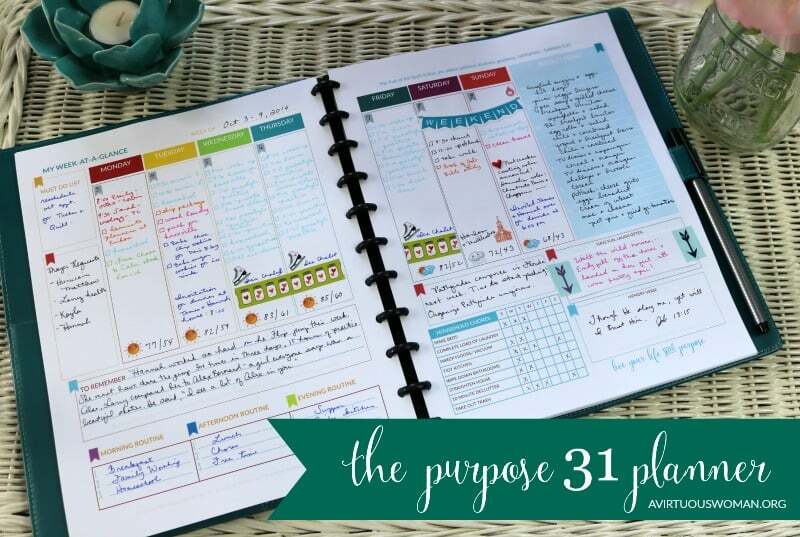 You can take this one step further and associate your planner with other positive rituals. Pour yourself a mug of coffee or tea to sip as you block your time and find your focus, or put on your favorite playlist to help you get into the right mood as you set your intentions and check out your to-do list. Keep your planner with you. Your planner should be a tool you rely on throughout your day to keep you on track and focused on the task at hand. If you aren’t carrying your planner with you, what purpose is it serving? Make sure you’ve chosen a planner size that fits your lifestyle. If you stay home most of the time, a larger planner may work well for you. If you are gone from home, you may find that a smaller size is more practical if it’s easy to transport throughout your day. Find an accountability partner. 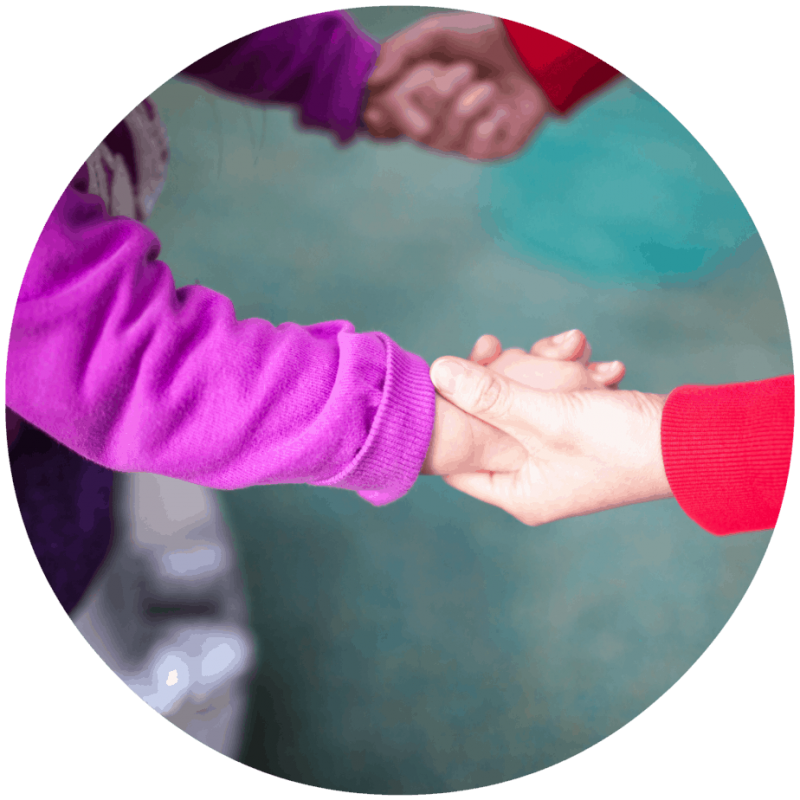 If you think you could use a little moral support in your journey to use a planner and stay organized, consider recruiting a friend to join you. Aside from giving you someone to connect with for advice and feedback as you build your planners, you can keep each other honest and hold each other accountable when it comes to using your planners with frequent check-ins. Make your planner valuable to you. Instead of tracking appointments, meetings, phone numbers, important dates, and other key pieces of information in your cell phone, make it a point to put this information into your planner. Once you know you can only get the information you need from your planner, you’ll be more inclined to keep it around and use it often. Starting any new habit can be tough, and keeping up with a planner is no different. However, with a little effort, you’ll quickly come to appreciate the benefits that come from actually using a planner to keep track of your to-do list, appointments, and notes. If you keep a planner, you probably use it to keep track of your daily to-do list. It’s likely a place you use to make note of your appointments, the errands you have to run, and the details of your child’s swim lesson or soccer practice, and it might be a place where you keep your ongoing grocery list or other personal reminders. But have you considered how your planner can help you move closer to your bigger, more long-term goals? While your planner should first and foremost serve as a tool to keep you on track as you navigate your day, you can also use it as a tool to help you meet your goals and tackle your priorities. This is especially true if you opt for a printable-based or disc-bound planner, which offer you total flexibility over exactly what layouts and templates go inside. With a little thought and creativity, you’ll easily be able to incorporate pages that let you do some goal-planning and prioritizing if you don’t already have them. Take advantage of forward-looking pages. Whether you create your own planner using printables or the disc-bound method, or you opt for a traditional book bound planner, make sure you pick something with space to accommodate your future plans. 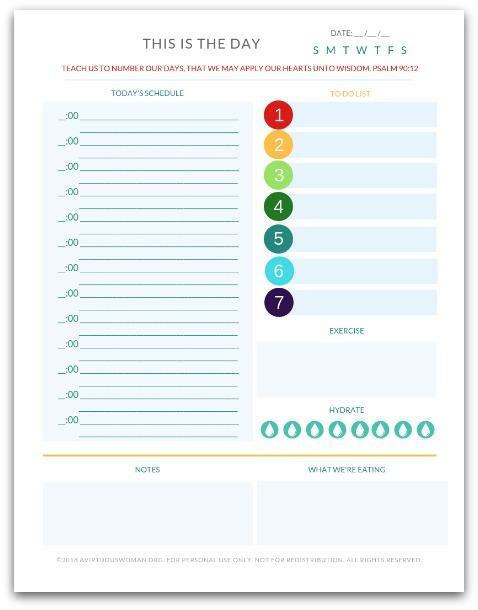 These can be planning pages, pages specifically dedicated to goal-setting or stack-ranking your priorities, or notes pages you’ve repurposed to help you focus on the future and what you hope to accomplish in a predetermined amount of time. Use your planner to schedule regular check-ins with yourself. Once you’ve identified your goals, it’s time to hold yourself accountable. Determine how often you need to check in with yourself to review the progress you’re making toward your goals. Then actually block some time on your daily schedule to make it happen. Make these check-ins something to look forward to by treating yourself to coffee at your favorite local cafe or a scoop at a nearby ice cream shop as you evaluate your progress and determine what actions you can take to move closer to your goals. Remind yourself of your goals as often as you need to. Use your planner to your advantage when it comes to tracking progress toward your goals. If you need to write down your goals each and every day at the top of the page as a way to center yourself and stay focused, do it. Alternately, if you like the sense of accomplishment that comes from checking a literal box, break your goal into bite-sized steps and create a weekly tracker to document your progress to motivate you to keep making progress. However you choose to do it, put your planner to good use and keep your goals on your radar. Your planner is not only a tool to help you manage your daily tasks, but it’s one that can help you reach your goals and make progress toward the things you consider priorities in life. When creating a planner, there are a handful of criteria most people use to determine whether or not what they’ve put together works. It needs to be functional, organized, and easy to use – but there’s something else. It also needs to be a planner you really love, one that makes you happy and really motivates you to use it. After all, if you aren’t excited to pull out your planner to organize the details of your day, chances are you’ll be able to come up with an excuse not to do so, and you’ll wind up falling back on old, unreliable methods to keep track of your to-do lists. By building a planner you love, you’ll boost the odds of making your planner a welcomed part of your daily routine instead of a fleeting interest. Consider your size requirements. If you’re hoping to bring your planner with you as you navigate your day, you’ll want to make sure you’re using something that’ll fit into your purse. You don’t want your planner to become a giant hassle to haul along. 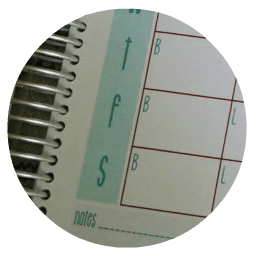 The beauty of using a disc-bound or printable-based planner is you’re free to determine the size that works best for you, so put some thought into it before you commit. Choose a cover that speaks to you. You’re going to spend a lot of time grabbing your planner out of your bag or from the top of your desk – make sure it’s something that’s going to make you smile each time you pull it out. Opt for a color you love, a quote that inspires you, or some other design that speaks to your soul and brightens your day when you see it. Experiment with layouts. One of the best things about using a DIY planner system is the fact that you aren’t stuck with any one layout. 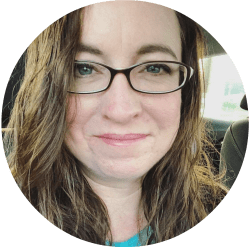 You’re free to reorder your pages however you’d like and experiment with templates until you find one that really helps you find your focus and plan your day. Make room for the things that matter to you, from space to make plans for the holiday season to a dedicated place to track your daily water intake. A quick search on Google or Pinterest will give you tons of options to consider for inspiration. Invest in a good set of pens. If you’re going to create a planner you love, you need to enjoy the physical act of writing in it if you truly want to commit to using it. Don’t force yourself to document your daily to-do’s and keep notes using a pen that feels awkward or uncomfortable in your hand. Instead, get pens you actually like writing with – ones that offer the right level of resistance against the page, are the proper thickness, with colors that make you want to keep on writing. The fact that you’re creating your own planner means it’s up to you to make it exactly what you’d like it to be. Keep these tips in mind as you begin the process, and you’ll emerge with a planner you’re sure to love as you perfect it over time. Now for my list of favorite planner accessories to use with my This is My Life! Planner. If you have any favorites, be sure to list them in the comments below! Staedtler Triplus Fineliner Pens, Pack of 10: These pens are the best pens I’ve ever used in my planner. They have an ultra fine point and there is no bleed through on the pages of my planner. I also love these Sharpie Fine Point Pens. You want to get organized, but life is so overwhelming at times that you can never seem to catch up. I get it. I’ve been there. I’m still there. 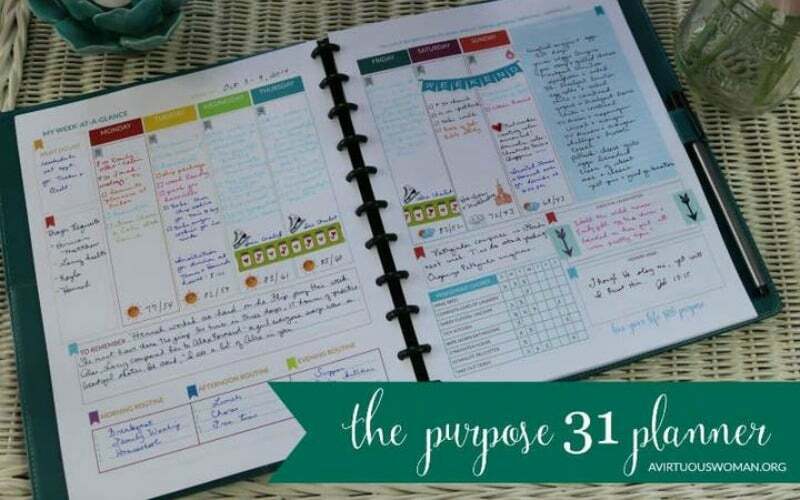 That’s why I first created the Purpose 31 Planner in 2013. I needed a better way to stay on top of household chores, menu planning, goal setting, and making lists. 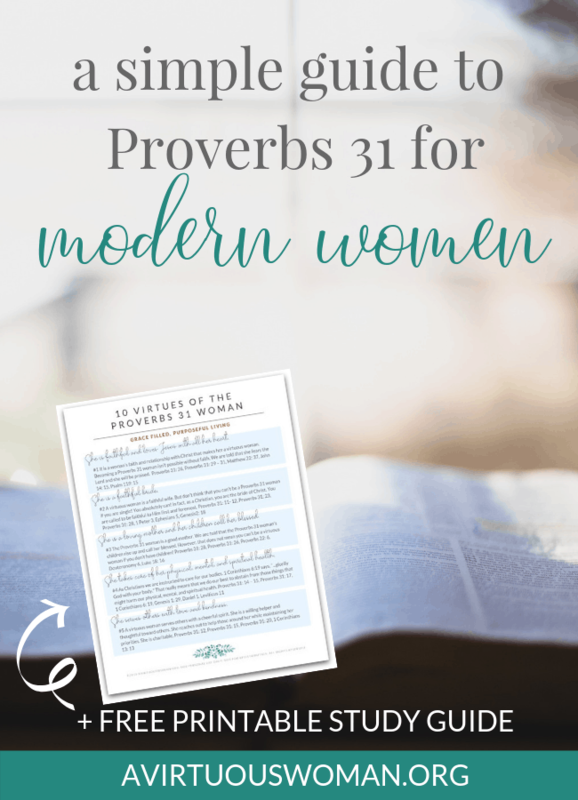 With weekly and monthly planning for homemaking, to do lists, and more, you’ll find plenty of room to write down all of that important stuff you want to remember. Okay, so I know what you’re thinking. You’re wondering if this planner will be like all the rest you’ve purchased over the years that. . . you thought you’d love, but they didn’t really work for your life. 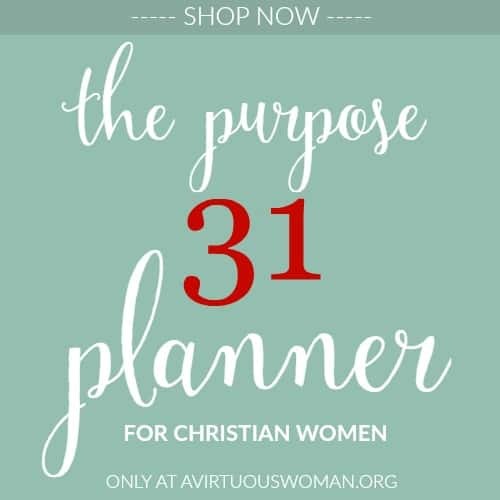 The Mary Planner is perfect for women who are home most of the time and want to stay on top of their household tasks. The Martha Planner is perfect for women who care for their homes, but also have an active lifestyle outside the home. 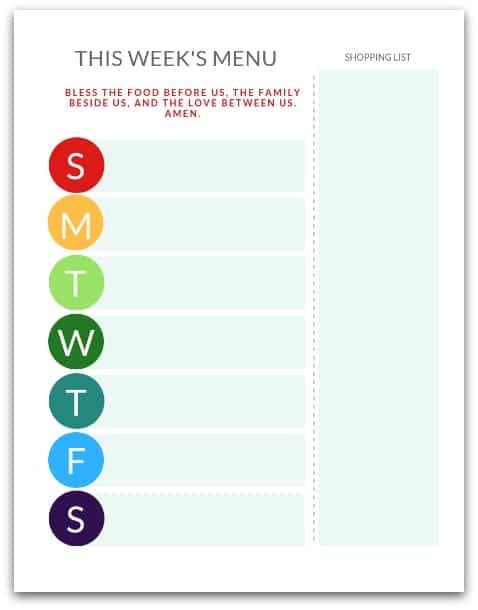 This simple to use – just print out and fill out – Disciplined Homemaker Menu Planner and Shopping List has plenty of space to write your week’s menu as well as jot down your shopping list. You can even easily cut the list off when you are ready to go grocery shopping using the dotted lines. 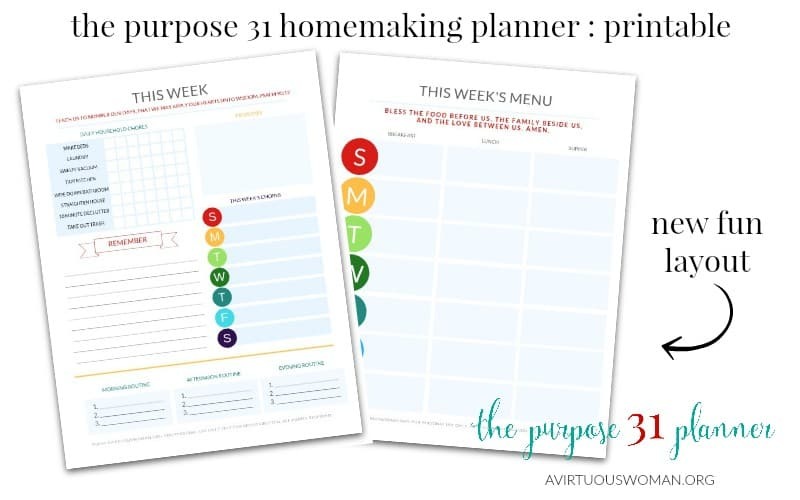 If you’re anything like me, and want to manage your home well and believe that homemaking matters, The Purpose 31 Homemaking Planner is the perfect solution to manage your home and family life. Our classic homemaking pages with an updated design. Fun and functional! 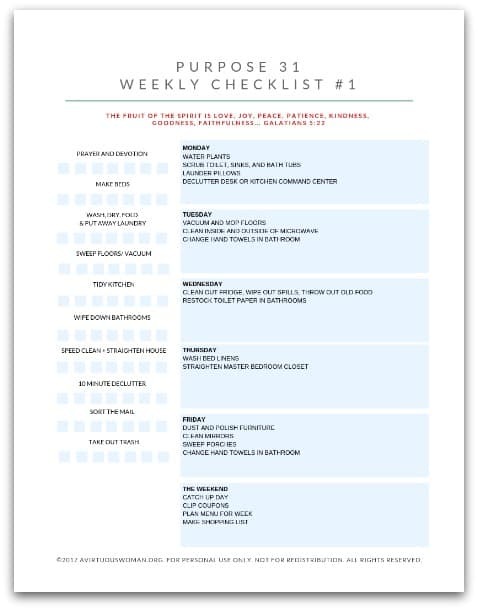 The Purpose 31 Weekly Checklists is a set of 52 weekly household checklists you can print and check off each days chores to keep your house clean and tidy. If you miss a chore one day you can do it when you have time – or just skip it because you know it will come back around in the rotation! The weekly rotating chores are listed Monday through Friday with a catch up day on the weekend. 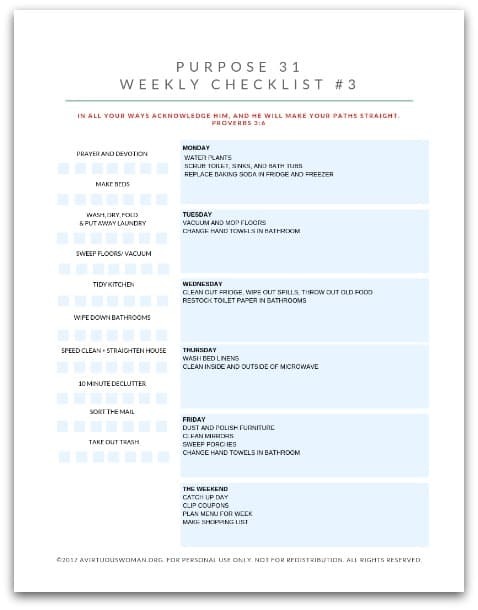 This is an easy to use, rotating chore list perfect for those of you who want to be told what to do each day to keep your home in order. Planning your week on Sunday can help ensure that you’re making the most of your time. Not only can you schedule items from your to-do list around important appointments and events, but you can ensure the most important things get done and that your priorities are met. 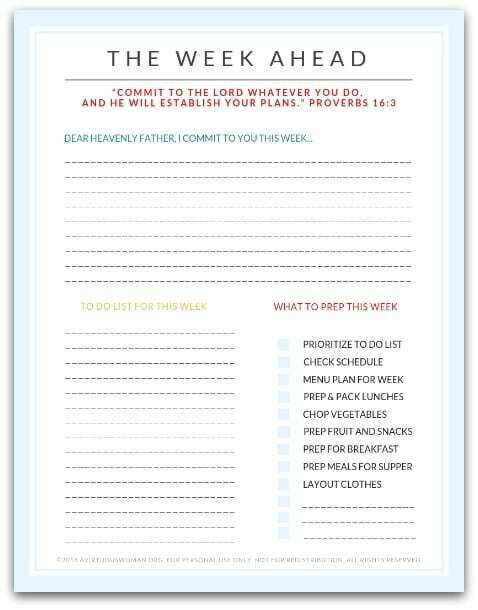 My Prep for the Week Checklist help you prepare! Sunday is the day that works best for me. I usually sit down sometime on Sunday afternoon to make plans for the week and work on prepping for the coming week. However, if another day works best for you, that’s okay! Just try to make your planning time consistent. Step Four: Meal Plan & Prep. Some days you just need a pep talk. Checking off items on your to do list gives you that little pat on the back that helps you feel like you really have accomplished something and that’s why This is the Day Daily Docket is perfect for getting things done! I can’t count the days when, in the evening, I wonder what it was I did all day. When you use a to do list, you have tangible proof that while the house may not be perfect, the floors may be sticky and you didn’t squeeze in a shower – you still got something done. The 8.5 x 11 printable planners can be used in a 3-ring binder or using the ARC notebooking system. Or, you can take your printed planner to your favorite office supply store, i.e. Office Depot or Staples, and they will spiral bind it for you for about $5.00. If you currently use a planner, how do you use it to organize your day? Leave a comment and let me know!